ACARS is a complex system which consists of several software modules which cooperate. Depending on whether you want to simulate an airplane or a dispatch/ATC station, you need another module. For airplanes, you need the ACARS Airborne Client. This is what you are now looking at. I added TLS (HTTPS) to the web server. However, many client software packages do not work yet with HTTPS, so you may try but the URL below is what is guaranteed to work. For people with MSFS, an all-in-one installer is available. But it does not yet include the latest ACARS Airborne Client 1.8. The client uses the standardized ARINC 739 MCDU as its pilot interface. All interaction with the system, both for dispatch and for ATC, runs via the MCDU. The airborne client creates two modes on the MCDU: ACARS mode (used for messaging between an aircraft and its dispatch office or other aircraft) and ATC mode (used for standardized messaging between an aircraft and an ATS unit). Both modes can be accessed via the MCDU Menu and via dedicated MCDU function keys: ATC for ATC and FMC COMM for ACARS. You should first initialise the ACARS system itself, by filling in your flight number (ATC call sign) such as KLM1234. This is sufficient to be seen as online on the ACARS system. You also will want to fill in your dispatch office's call sign, which in this case probably is KLM. All automatic functions now work and if you desire you can leave ACARS alone from now on. A complete manual is available: get it here and check Chapter 8 (only). For ATC contact via CPDLC, you need to log on to an ATS unit. These have four-letter ICAO call signs, such as YSSY. They will be made known to you via publications and other media, or via standard voice contact. Use the ATC mode of the ACARS system to log on to this unit, and wait for the incoming "ATC COMM ESTABLISHED" message. You are now in direct contact with ATC and can send requests, or reply to ATC clearances. Notice that there must be a live ATS unit online, otherwise this whole function does not do much! You can find a pretty good partial manual on the web, and a partial interactive demo. For people with MSFS, an all-in-one installer is available, but it does not yet contain the latest ACARS Airborne Client 1.8. For PS1 people, only the first three programs are relevant. For MSFS people, they will need the fourth program as well, plus a registered FSUIPC. The first three programs may be installed on any computer. The last one, WFAcars, must run on the FSUIPC/MSFS computer, unless you use trickery. For the PS1 simulator, there is a central message exchange program that is used by all add-ons. You will need to install this, even if you don't have PS1, as all other modules use this so-called Communication Broker to communicate. Luckily it isn't complex and does not hose your system forever. Fetch it and use the install program to get it up. Disregard its complaining about PS1 updates, it will notice that there is no PS1 in a few seconds. Done! You may minimise the Broker, it needs no user interaction. Next time, just start it. Next, fetch the MCDU. This one also comes with a normal Windows installer. Run the MCDU. It will not come out of the box working, you need one setting: config, broker IP. If you run it on the same machine as the Broker, just fill in 'localhost'. Type 'L', click line select key 1R. The Broker will now recognise the MCDU. Done! Next time, just start it. Next, fetch the ACARS airborne client. Install it, run ACARS. Use the menu File > Setup. Fill in the Broker Host: either 'localhost' or the correct IP. Fill in your ACARS logon code (request one now!). Select Join ACARS Network. Ok. Done! This program may also be minimised. Next time, just start it. Lastly, if you want it, and only for MSFS, you need to fetch an interface program between FSUIPC and the Broker. Without this, it works, but you do not get any data feed. This means that position messages etc. need to be manually entered by the pilot. Get a feel of how the PS1 crowd does things? 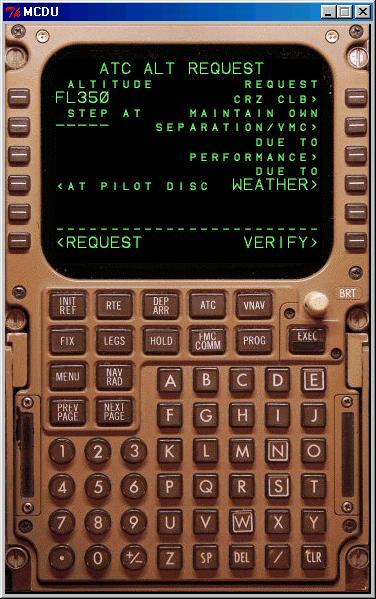 The only config you have to do (once) is to tell the program what options you want on your flight deck. This is the single occasion that you need to click with a mouse on stuff, all other manipulations are done via the MCDU. Go to File/Setup for these options. The IP address or host name of the machine where the Broker is running. If you have everything on the same machine, use localhost. 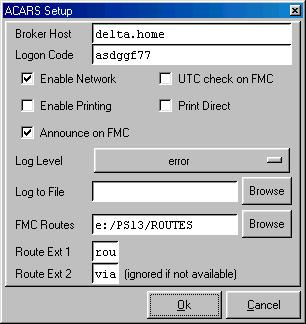 Your personal ACARS Logon Code as mailed to you. If you want your logon code, register one. If for some reason you want to stop ACARS to go out onto the network (say, your internet link is down and you get tired of the error messages), you can switch the system off here. MCDU modes will remain available. In case your PS1 clock is supposed to be on UTC, this feature will generate warnings if the PS1 clock deviates too much from the PC clock which is assumed to be correct (time zone is taken into account). This allows you to print messages to a printer connected to LPT1. Make sure it really is LPT1. If not, an attempt to print will hang the program. Messages sent to you from your company dispatch station, and all messages by the server itself (mostly your weather requests) will be printed as soon as they are received. After docking, your OOOI report will also be printed automatically. Needs printing enabled, of course. If you have PS1, the PS1 CDU and EICAS will show that you have an ACARS message waiting. Level of chattiness of your log window. Notice is probably a good general setting here. If you want a file written, enter it here. Enter here the location of your sim's routes folder. Downloaded routes are dropped here, as ACARS.something. Enter here the three-letter extension of your sim's route files. For PS1 this is ROU, for MSFS often RTE. Enter here the three-letter extension of your sim's secondary route files. For PS1 this is VIA. If you sim does not have these, what you enter here is irrelevant. On the MCDU, press MENU. Select ACARS mode. Fill in your flight number, such as KL1234. Fill in your company code, such as KLM. Done! You are online with ACARS and can start sending messages to other stations, ground and airborne. Instead of going through the menus, you can also use FMC COMM to access ACARS and ATC to access CPDLC. These buttons bring you straight to the most logical place, which for example is the last received unread message. ATC EMERGENCY MODE can be accessed by pushing ATC twice, instead of holding the button down. On some systems, holding down actually makes the key auto-repeat, which will have the same effect. You probably want to look at the ACARS walk-through to see all options in relationship. For putting your plane position on pretty maps, you need to enable ADS-C reporting. This is not automatically, just as it isn't in real life. You need to manually activate ADS-C reporting. In case you wonder what the #@$#%$@ goes on under the hood, you can look at the ACARS network log. If you would like to peek at the sources or extend the program, you're welcome.